I often get asked this. Is someone who only drinks in the evenings and/or weekends an alcoholic or not? The typical image of an alcoholic is someone who wakes up in the morning and starts drinking. So does someone gets up and goes to work each weekday and manages the normal things in life have an alcohol addiction? What defines it? Is it the amount of alcohol they drink? Is it how often they drink? Is it what time of day they start drinking? Actually it’s none of these. It’s about the compulsion to drink. It’s when a person no longer has control, the ability to not drink when they normally would and to stop drinking when they want. For many people, drinking is restricted to certain times of the day, commonly to the evening and/or weekend. This is because their drinking has always been at this time of day – after work or after the kids have done to bed. This pattern has been there from the time when it was just “one drink to wind down at the end of the day” until it reaches clearly excessive amounts like a bottle of vodka every night. It’s the structure of life, the responsibilities which keep the alcohol consumption limited to certain times, even when the decision to drink becomes a compulsion and not a choice to drink. It’s a common problem in our society, a hidden epidemic in our suburbs. Most people in this situation are aware that they drink too much for their health and feel awful in the morning as a result of their drinking the night before and the poor quality sleep which follows. Many are also aware that they have lost control over the amount they drink in the evening although are comforted by the fact that they only drink in a restricted time of the day. But they also don’t want to go down the route of the current treatments for alcoholism with their obligation of total abstinence. It’s an uneasy place to be – aware that things are not right but also not bad enough to self declare as an alcoholic and go down the treatment route. And they’re right to feel uneasy. The line between compulsive evening drinking and uncontrolled drinking is not hard to cross. What it requires is a disruption to normal life and its routine: it might be as ordinary as a holiday or as tragic as the death of a loved one. The commonest are loss of employment or the breakup of a relationship. Alcohol moves in quickly to fill the void and ease the pain. My patients often describe this transition as “when the “off” button disappeared”. So does baclofen provide an option for treating evening drinking? Yes. My experience is that it works very well for this pattern of drinking. Why? Because there is still a degree of control around drinking as well as a routine and structure to the day. Alcohol occupies part of the day but not all of it. The baclofen can be used to reduce the amount of alcohol to lower, safe amounts or with the aim of ceasing drinking completely. There isn’t an obligation to aim for abstinence although some patients who originally intended to continue drinking in small amounts find that they are no longer interested. Others aim for and find themselves able to achieve true “social drinking” on baclofen – small amounts of alcohol enjoyed in the company of others without the urge to go beyond this. There are two ways of using baclofen to assist with evening drinking. Baclofen can be used in the classic regime with doses spaced over the whole day or alternatively by using closely spaced doses from mid afternoon onwards to cover the drinking time in the evening. So who needs which regime? It’s not always easy to decide but people who are anxious by nature and crave alcohol when stressed will generally be better with baclofen doses spread over the day. People who have no cravings for alcohol before or during their working day but whose desire to drink appears at a fixed time in the afternoon could try time targeted baclofen. In TTBT, the timing of the baclofen doses over the day is different to the classic regime (link) but it’s otherwise the same. Baclofen is started at a low dose which is slowly increased until the desired effect on drinking is reached. 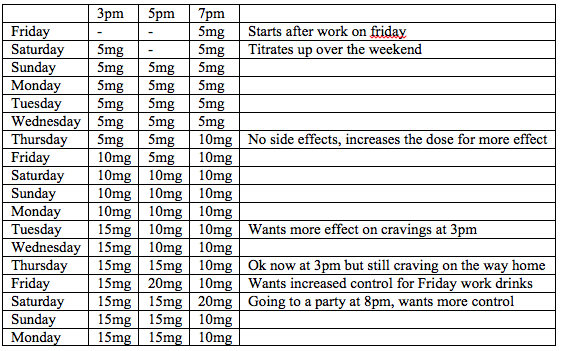 My practice is to start with 5mg doses and increase by 5mg per dose every 3-6 days. People who are concerned about side effects can do their dose increases on weekend days or days off. The timing of the doses is different to the classic regime because they are clustered around the time of greatest need. Here’s how it’s done. Firstly it’s important to establish when the cravings for alcohol start in the day. This is typically sometime between 3 and 5pm, when the end of the working day is coming. The brain “clicks” on and starts to plan or think about the evening’s drinking. So the first baclofen dose is taken an hour before this time. The next doses are at 1-2 hour intervals after this, the stacked doses pushing the blood levels of baclofen up to cover the time of greatest risk of drinking. For example: if the trigger time is 4pm, the first dose is taken at 3pm. The next dose is taken at 5pm, just before leaving work, and the third is taken at 7pm. Someone whose usual pattern is to purchase the evening’s alcohol on the way home might need a first dose at 3pm and the next at 4pm for a departure from work at 5pm in order to strengthen the ability to arrive home without alcohol. Another dose might be needed at 6 or 7pm to keep control and avoid going out to purchase alcohol later in the evening. Generally the doses don’t need to go late into the evening as two to four closely spaced doses will provide enough baclofen until bedtime comes. The motivated patient will work out how to time the doses for the desired effect – to have good control over the whole evening. They will also be able to adjust the amount of each dose upward to what is needed at each time They will also add extra doses of baclofen if needed on particular evenings where there is more temptation to drink. This patient’s cravings start like a clockwork at 4pm each day. He decides to start baclofen at the end of the working week so that any side effects are experienced on the weekend. That works fine. After 4 days on 5mg at 3, 5 and 7pm, he moves up to 10mg doses but finds that the 10mg dose at 3pm is still not enough to stop his cravings kicking in at 4pm so takes this dose up to 15mg. This works better to stop the 4pm start of cravings but he is still craving on the way home from work and finding it hard not to stop at a bottle shop on the way home so the 5pm dose is also raised to 15mg. The end of the working week means Friday drinks so a larger dose of 20mg is taken at 5pm to keep him on track around the temptation of others drinking around him. Similarly, he takes a 20mg dose before going to a party on Saturday night but on a normal evening at home, the 15mg/15mg/10mg regime are sufficient for good control. The dose of baclofen required is very variable and it needs to be titrated individually in each patient until they reach a dose at which they have comfortable control over their drinking.